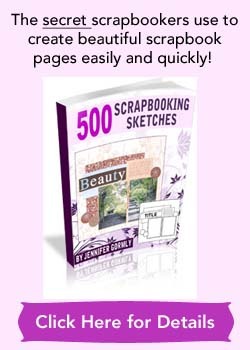 Accumulating your scrapbooking supplies? Let these practical and affordable scrapbook storage solutions help you sort out your supplies fast. 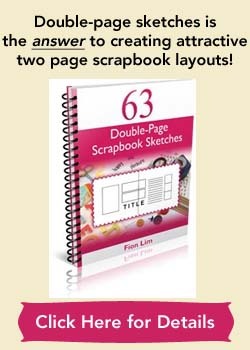 Instead of spending time working on your layouts, you’re wasting precious minutes hunting for your scrapbook supplies. You’re getting frustrated with the wasted time. Don’t let disorganized scrapbook supplies kill your mood for scrapbooking. And when you don’t see something, you tend to forget about it and don’t use it. That goes the same for your scrapbooking supplies you have hidden somewhere. Effective storage organization will help to maximize usage of your supplies. Here’s a few creative solutions you can use right now to get a headstart in sorting out your ever-increasing supplies. Some of these ideas involve getting some low-cost or affordable organizers. Who knows, you might even find some of these mentioned storage boxes or organizers lying somewhere in your house. So let’s get familiar with these easy storage options and get your supplies into order! Cardstock usually form the bulk of scrapbooking supplies. To find your cardstock quickly, sort your cardstock by color. Then you can use dividers to further divide your cardstock according to shade or manufacturer. 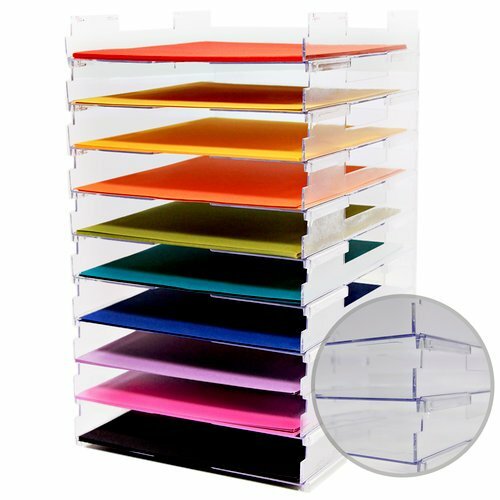 Stackable paper trays or vertical paper holders? Stackable paper trays keep your paper lying on the flat, and they can be a great space-saver as the trays stack upwards. With vertical paper holders, your paper might bow unless you can keep the both ends compressed. Patterned paper can be so lovely and gorgeous. At the same time, if disorganized, can be quite a nightmare to search out. There’s three ways to sort. You can sort your patterned paper by theme, manufacturer or color. Which scrapbook storage method to use? It’s up to you. For example, if you usually gather your page materials by theme, you might want to sort your patterned paper by theme also. Besides markers that should be stored horizontally to keep the ink running smooth, other pencils and tools can be stored in any manner. If you have lots of pens and tools, consider investing in a pen caddy which is a handy scrapbook storage solution. If not, just grab some unused cups to store your pens and tools. Paper scrapbooking is about paper. Naturally, you’ll find yourself loaded with scraps, tags and die cuts. After sorting your paper pieces by type, theme or manufacturer, you can put them into page protectors of mini albums. This way, you can simply flip through the mini-album and know what you have on hand. Another option is to get a library or recipe-card files with dividers and insert your paper pieces into the slots. It’s a great way to get your paper pieces organized quickly. Do you have many sheets of rub-ons, stickers and lettering templates? For stickers and rub-ons, you can choose to sort them by theme or manufacturer. As for lettering templates, you can sort by color, style or manufacturer. One simple idea is to use an expandable accordion file to house your embellishment sheets. The second method is to use page protectors of a spare album or a three-ring binder to hold them. 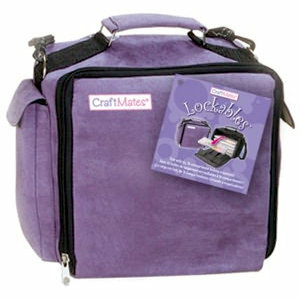 Brads, buttons, eyelets, fasteners and charms can fill up your scrapbooking storage fairly fast. They also tend to get lost rather quickly. Sort them by the type of accents. And if you happen to have a big collection of small embellishments, you can further sort them out by color or even style. Do you have unused plastic bead boxes or floss boxes somewhere in the house? Dig them out and make good use of them. Use these boxes to hold your tiny embellishments. Please make sure that your organizers come with divided small compartments to hold different type of accents. And oh, you might want to make sure the box’s lid is secured. You don’t want your tiny embellishments to spill out and fall all over the place. Can’t stop buying loads of flowers, chipboards, alphabets and acrylic shapes? Sort them out by the type of accent, then by color, shape or manufacturer. For alphabets, you can sort them out by letter or style. To help to locate your pieces easily, remember to get clear containers that you can see through. Fishing tackle boxes or canning jars work marvelously well in containing your small or medium-sized embellishments. Are you tired of having a bunch of tangled ribbons? Do you wish for knot-free and accessible ribbons you can just pull out, snip off and use? Sort out your ribbon strands or spools by color or design. Next find a paper mache box. Cut out chipboard cards that can fit into the box. Wrap your ribbons round the cut chipboard cards. Secure the ends of ribbons with bobby pins. This a is a great space-saving solution if you have limited space to work with. Alternatively, use up your toilet-roll holders and wrap your ribbons around them. Hope that these scrapbook storage ideas have given you some ideas to work with. 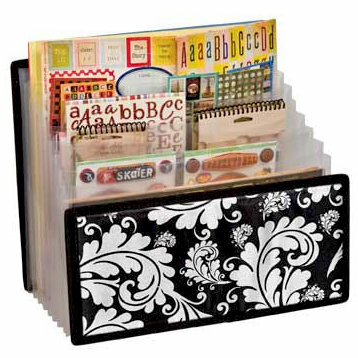 If you’re ready to invest in some quality scrapbook storage organizers, check these out. 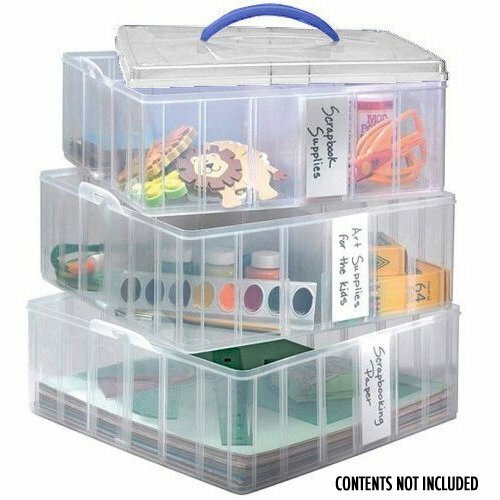 If you’re looking for professional and expert advice on organizing your scrap space, you might want to check out this e-Book (immediate delivery and download), A Scrapbooker’s Guide: Organizing your Tools and Workspace. Happy scrapping with organized scrapbook supplies!